The Pyongyang University of Science and Technology (PUST) completed another annual academic cycle last Wednesday, with a Graduation ceremony at the campus on the south side of Pyongyang, capital of the DPR Korea. One hundred (100) undergraduate students in science and technology received Bachelor degrees from the international and DPRK-side co-Presidents and other academic leaders of PUST. Twenty (20) graduate students received Masters degrees. The ceremony was also attended by members of the foreign and diplomatic community of Pyongyang, including ambassadors or their deputies and other representatives, from several European countries, Brazil and the UNDP office. The BSc graduates have completed four-year courses, all taught in English by international faculty. Subjects cover agriculture and life sciences; electrical and electronic engineering, computer science; and finance and management. Some students will remain at PUST to work for Masters degrees. Most others will go to various DPRK state universities for further study or to work in research institutes or administration, such as banking. 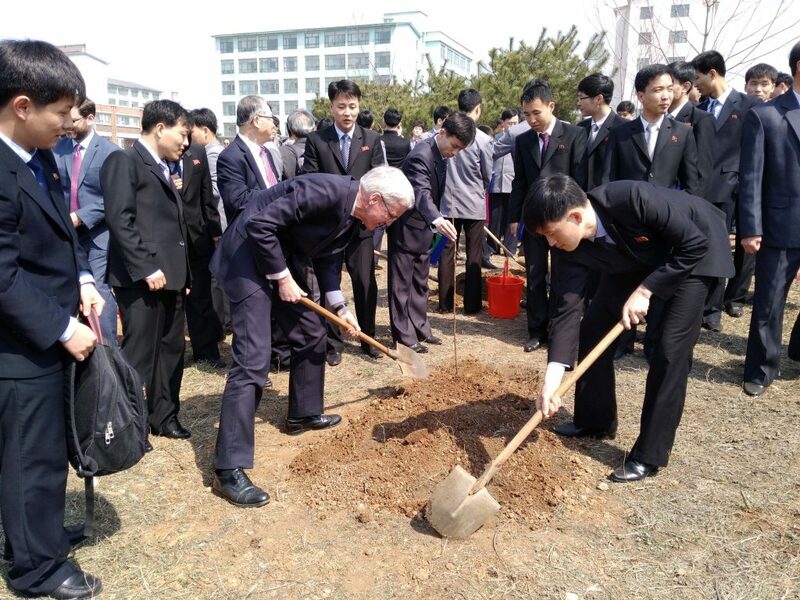 After the ceremony in the main auditorium of PUST, the students, faculty and guests went outside to plant trees: a traditional graduation practice, which is both functional and symbolic of a desire to work for the future good of the Korean people and the wider world. Dr Chinkyung Kim, the overseas-Korean founder and President of PUST, told the students to remember not only the academic content of their studies, but also the ethos and values of PUST: an international outlook in the DPRK, with integrity and care for others. Student representatives gave speeches of thanks on behalf of their class-mates; and a representative of the international faculty of PUST encouraged the students to continue to “ask, to seek and to knock… in order to receive, to find and to open doors”. The current international scrutiny of the DPRK causes some operational difficulties for PUST, but the university is continuing, and taking care to work within limits imposed by the application of international sanctions. PUST has a strict policy of peaceful educational development and international exchanges, with the aim to build bridges and better relations.